In 1987 Jan Carlzon published the book “Moments of truth”. It dealt with leadership and customer attendance, and there was a sentence which was the mind of the whole reading: The only thing that counts is a satisfied customer. When it comes to hearing the customer, SAP has a program called SAP Customer Influence in which the clients can suggest changes and improvements in applications. These improvements go through a process of analysis and validation in order to determine if they can be applied to several customers and, of course, if they are likely to be implemented. For more details about the process of analysis, suggestions and how to collaborate, click the link- https://influence.sap.com . Going along, in this case, means suggesting, opining and occasionally, even testing the beta solution. Of all available improvements, there is a group that caught my attention and which I detail below. The complete list can be obtained in the SAP Customer Influence link. As I haven’t tested all the functions, some of the images are either from the notes or from the closing presentation of the 2017 cycle. There are now enlargement points in the documents flow that allow you to create specific flows, with descriptions, setting document status and releasing the direct call of the document “Z” as if they were standard, clicking in the icon “display document”. The solution has a technical approach, based in exits, and in the SAP NOTE there is a well-detailed attach which includes code examples to implement the improvement. In short, now we can register the time the customer wants to receive the material, considering working days and some other scheduling variables. 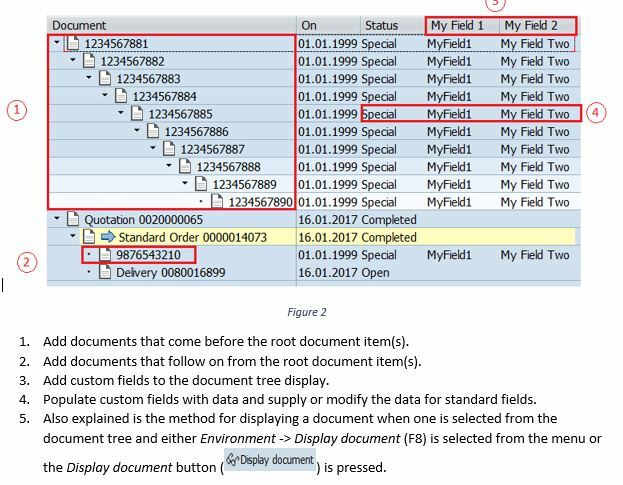 Pay attention to BAPI – ORDER_HEADER_IN-REQ_DATE_H since this information can come by interface as well. The reasons for rejection for sale order can, from now on, be registered by document type and sales organization. It helps a lot to reduce the reasons for order and rejection which only attend a specific scenario without utility for all. To attach documents in the creation of sales order, was necessary to save the order and open it editing – the same thing was valid to other VAXX documents. Now it is possible to attach documents in the order creation itself. The activation of this function is pretty simple, and basically goes through one manual procedure of activation in parameter via SE80. Do you know when you’re opening a sales document in the wrong transaction and the system shows up the message that the document XXXXXX can’t be opened in the VA01? Or in the VA31? Or in the… and so on? That is it, now the system directs you automatically to the right transaction. Let’s face it, this adjust took long to be released! The report presents now other selection filters, which makes easier the blocking vision. Known scenario: the material has a default measure unit in Kg, but the customer wants to buy it in tons. Now in the VD51 (reg.info customer x material) it is possible to register an sales unit of measurement for each client. There are still 29 other changes just like these, with huge value to the customer. And, returning to Jan Carlzon, for those who like aviation and subjects related to management I suggest this reading, that even after so many years it keeps very interesting. “Moments of truth”, Jan Carlzon. Thanks for posting this and taking time to translate to English! There were quite a few helpful enhancements delivered as part of that Customer Connection, it’s a pity that they seem to be mostly remain unknown to the SAP Customers. I tried to compel the project manager to share the results on SCN and not just on the obscure influence website but looks like that didn’t happen. It’s really odd. If I was SAP and delivered such useful things to the customers for free I’d be screaming about it from every rooftop in town. Unfortunately I agree with you. There are some points in SAP communication that really, it is hard to understand. But, after be familiarized with the “not so new” SCN site, the customer influence site looks as the 9 wonder of the world. By the way, we have a lucky to be flexible when we need. And to be aware about the newest things, to share the information and engage the community, when all data are covered by layers and layers of navigation, show me that our flexibility is pretty unlimited.